In the middle of the night, Creusa wakes to find her beloved Troy engulfed in flames. Ten seemingly endless years of brutal conflict between the Greeks and the Trojans are over, and the Greeks are victorious. Over the next few hours, the only life she has ever known will turn to ash . . . I love mytholology — after all, I ran a whole readathon based around it (and Round 2, Norse themed, is coming in September). I’m tempted to keep this for #mythothon 2 but, realistically, I’ll probably read it as soon as I can grab it. Typically male-centric narrative, reframed to consider and focus on the women? Done! The cover looks subtle and beautifully classy. And I think it’s going to look even more stunning in person. 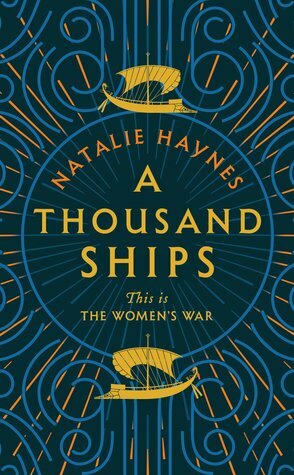 The description of A Thousand Ships makes me think of The Silence of the Girls by Pat Barker, also set around the Trojan wars. I didn’t rate it as highly as others but it was definitely well written. I agree about the cover, it’s simple and yet classic and nice 😀 I’m also very excited about Mythoton 2! I don’t know much about Norse mythology other than Loki being queer, so I’m double excited to see your recommendations and the prompts. I’ve read so little Norse retellings, this readathon is going to be an adventure lol. I’m hoping to squeeze in a few before Sept, but I might aim to read more actually themed books this time around. I don’t think I read any other than Magnus Chase 😀 I have a copy of Gospel of Loki but haven’t read it yet. I doubt I’ll put it off until September, but who even knows with my reading schedule. I liked Gospel of Loki! 😊 I read that series last year. It does go off script or add much to the mythology, but it’s really nicely written. Just added this one to my Goodreads! I love all things mythology. I also need to read The Sky in the Deep, especially after the sequel cover reveal. God yes, that cover is stunning! I was going to say it A Thousand Ships sounds a lot like The Silence of the Girls, but somebody already beat me to it! I’m interested in any case. Thanks for sharing. You’re very welcome 😊 it sounds wicked, doesn’t it? Nice pick! That’s a totally new to me one! I hope you thoroughly enjoy it once you get it! I’ve always been fascinated by mythology as well. Sounds like a good one. Great choice! This sounds so good. I really love mythology too so I’ll have to add this one to my TBR. Great pick! Oh wow. I think I need this, and it’s totally new to me too. Yes to more mythology! Love the sound of this. Also hope you love Sky in the Deep! Ooh, I love that cover! Oh yes, Troy framed to be from the POV of women? YES we need more stories like this! Ohh great CWW pick this is the first time I have heard or seen this book and it looks absolutely amazing, I hope you really do enjoy it when you get the chance to read it. Thank you so much for stopping by my CWW post last week. I love the sound of this! I am interested in mythology too and I love that this one focuses on women. Thank you for bringing this one to my attention!